If you have a Roman coin that you want to identify look no further. If you want to delve deeper into the coin, emperor, or particular period the book is an excellent starting point for further and deeper research. 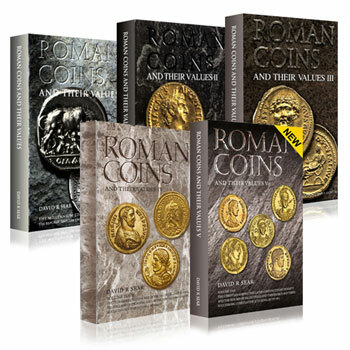 With over 1600 colour photographs this is the only book on Roman Coins you will ever need! 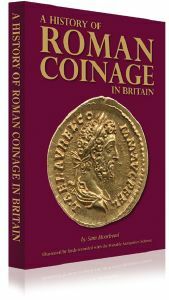 Written by Sam Moorhead of the British Museum, this book provides a chronological overview of Roman coinage from the Republican period (300BC) to the early 5th century, with an emphasis on Roman coinage used in Britain. The text provides an introduction to the history of each period and then outlines the coinage (denominations, mints, contemporary copies etc. ), using Portable Antiquities Scheme (PAS) and British Museum (BM) coins as illustrations. Throughout, indications are made of the numbers and distribution of particular Roman coin finds in Britain. Thank you very much for the copy of The History of Roman Coinage in Britain. It made my weekend and I keep dipping in and out of it whenever I have time. 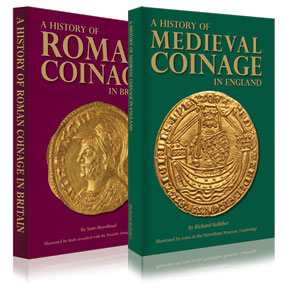 It's a great book because it talks about Britain's Roman coins in a way that hasn't been done before – down to earth without being dumbed down – and it displays delightful images of these coins in a manner which hasn't been seen in any previous reference book: instead of showing glossy pictures of glamorous, pristine, mint-state coins, it shows them as they most often come out of British soil, corroded and with bits missing. I love the coin captions especially; each one contains a golden nugget of useful information. The production quality is impeccable too. I take my hat off to Sam Moorhead and Greenlight Publishing. It's a stunningly good book and I know it will be a screaming success. Why? Because it doesn’t scream look at me, look how clever I am! It gets on with the job of being hugely helpful to the reader.